This was a rewarding pool table move job that my assistant and I recently did for a famous motion picture director named John Guillermin. 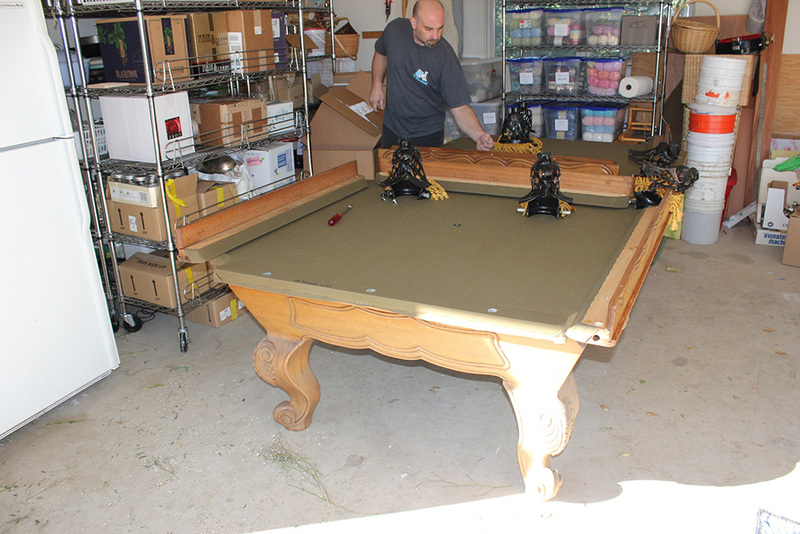 John explained to me the origin of this massive nine foot slate pool table. He told me that a Danish craftsman had built this beautiful billiard table for him in the late 1960’s. Apparently the table was manufactured by Delmo Billiard Mfg. of Los Angeles, CA. 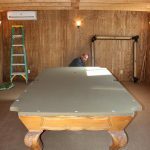 I’ve serviced a lot of Delmo pool tables in my career as billiard mechanic, so I know these tables were built as solid as a tank. The fact that this table is nearly 50 years old and that the mitred corners of the cabinet are still tight tells me that the Dane who crafted this and all of the pool tables Delmo cranked out of their LA factory should be considered family heirlooms. About seven years ago John hired us to move his pool table to a friends house up in the mountains of Ojai, CA. for safekeeping. There it sat in a garage, covered and lonely for nearly seven years. John had resettled into a new home and was anxious to have his baby back with him again. He had an ample size billiard room built just so he could relive his pool playing days. John told me that he and his good friend Fred Astaire used to play pool on this table late into the night. John was very glad to be finally reunited with his Delmo pool table. Hello, I have a Delmo table that is in amazing condition, and I am looking to sell it. I have no idea how much they are worth. I would love to hand on to it, but have no more room. Unfortunately, Delmos aren’t really worth a great deal of cash (even in great condition). 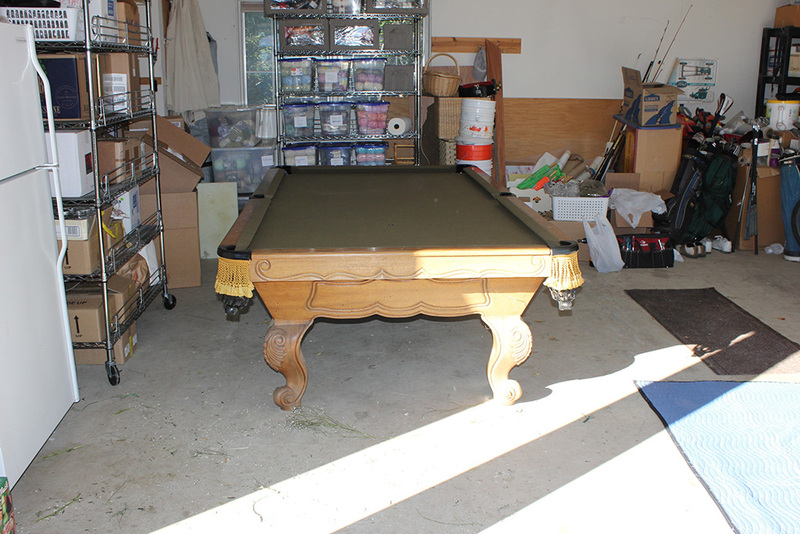 Please research your area to find market value of used pool tables. A few hundred is likely all you’d get for it in our neighborhood. That is a NICE table! We have an 8’x4′ Delmo table. Can you tell me whether it is a 3 slab or a 1 slab table. Hi Alan, to best of our knowledge all the Delmo pool tables we’ve worked on have been 3 piece slate. 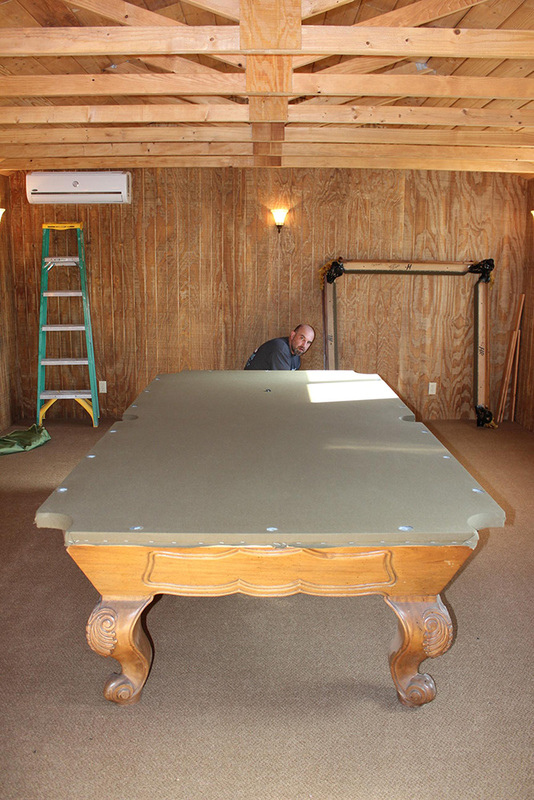 We have seen many Delta pool tables with one piece slates though. Best way to determine is by looking under the rails where the railbolts (large hexbolt threading vertically into the rails) are located. On a 3 piece slate pool table you should be able to see the slight separation between the slate liner wood. Sometimes crawling underneath the table and checking for the cross beams. 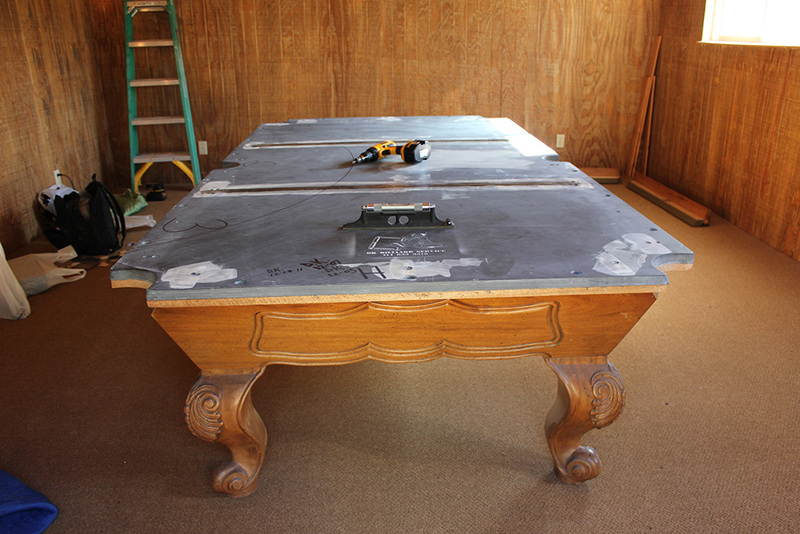 Usually most 3 piece slate tables will have 2 cross beams running the width of the table. As a last resort you can always disassemble your pool table to determine this. 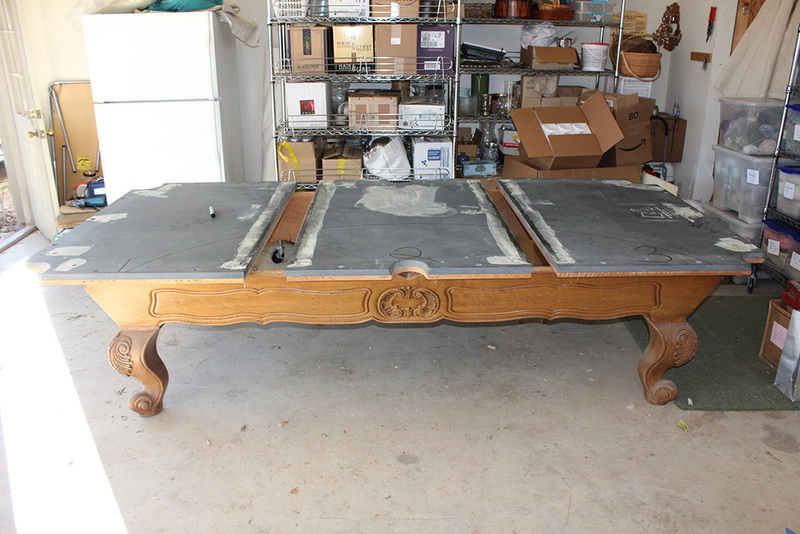 I have a Delmo pool table 4 ft. X 8 ft. With a 3 slab top. The plate on it says Custom Made in Carson City California for … Terry L. Seals … Or the name could be ..Jerry L. Seals. I like to know the Date it was maufactured. Hi Mario, we’re not familiar with the Delmo billiard table’s that were manufactured in Carson City. Those tables may have been produced after the company disbanded. As far as we know most all Delmo’s were manufactured in Los Angeles in the 1970’s-80’s? That’s a fun bit of history. If the pool table is autographed, it may increase value a bit. Unfortunately, Delmos aren’t really worth a great deal of cash (even in great condition). Please research your area to find market value of used pool tables. A few hundred is likely all you’d get for it in our neighborhood. I just picked up a Delmo but the plate says it was based in Gardena, California. It also has a plate on one of the legs that has a serial number on it. Could I use it to track manufacture date and possible ownership. I live in Carson City, Nevada and am an avid pool player locally. I also have a 1967 Foremost that I would love to get more info on. Thanks Dave for all the info. I am self teaching the ins and out of pool table mechanics work. Delmo Billiards started around 1967 in my father-in-law’s garage by one Norwegian and 2 Yugoslavians. I happen to be married to the Norwegian. thanks Virginia, delmo pool tables are very well made. Thank you for your reply. Unfortunately, I do not understand what you mean by #6 irons not fitting or Delmo pockets to refurbish. Are you saying that Delmo felt is difficult to redo? As a former owner of Delmo Billiard MFG, I don’t understand your problem. Hello Odd, you know maybe after you left the helm of Delmo someone mistakenly changed the diameter of the iron pins and the radius is also different from traditional#6 irons. I’ve done my fair share of Delmo Billiard tables and have spent many frustrating moments trying to beat with a mallet an “out of the box” set of #6 pockets only to fail to close the unavoidable gaps that appear near the corner pockets. Not to mention the difference in circumference between the Delmo iron and the traditional #6 pocket irons. The problem I’ve always encountered when trying to install a set of std irons is the process of tightening the pocket bolts always pulls the iron down too far, thus leaving the top of iron covers way below the top rail. What are your thoughts Odd? Maybe the new owners changed the iron dimensions since I left the company. In my experience, when the pocket gets thrown down too far, drill hole in the rails could be worn out or getting bigger because of wear and tear. I have plugged holes and pre drilled the rail or I would put in metal sleeves. As far as it goes to the opening in the corners, I’ve never experienced that myself. It could be because the hole is too big. Did you sell the company? And to whom did you sell it? What year did you start, run and ultimately sell Delmo? The metal sleeves are a good idea I’ve seen them inside of antique billiard table rails the sleeve would do well against the “rounding out” of the pocket holes. There was a pocket manufacturing company named RC Designs that used to produce pocket iron shims that you could insert into the iron pin holes of the rails, thus allowing the installer to thoroughly tighten each pocket bolt all while keeping the tops of the pockets slightly above the rail tops. The shims worked great whenever you were swapping out a set of either Delmo, Adler or an antique Brunswick table where the diameter of the pocket iron pin hole was greater than the diameter of the replacement pocket iron. Hello Sherry, I apologize for my technical jargon. Why don’t you read my response to Odd Kristiansen regarding the replacement of a Delmo pocket with a standard #6 iron pocket. 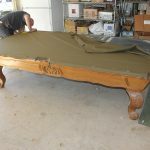 And to make clear for everyone, recovering a Delmo Billiard table is in no way more difficult than an Olhausen or any other quality Billiard table. 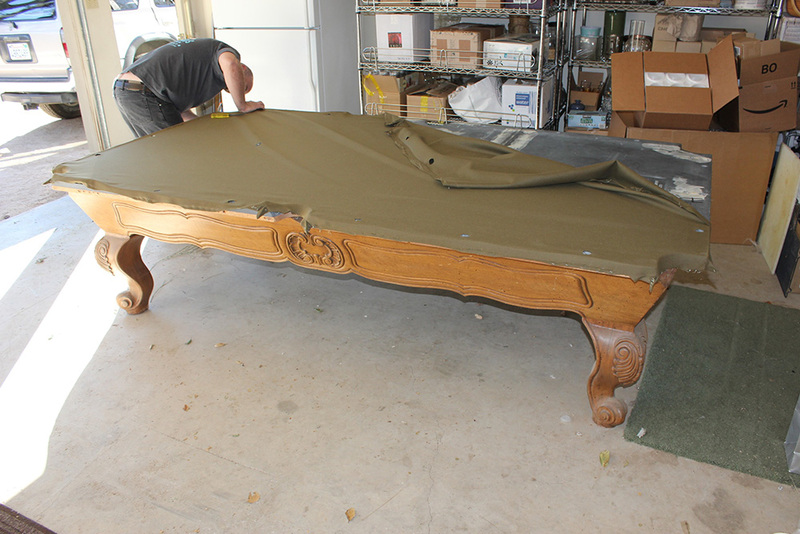 It’s nothing like recovering a commodore/American Classic/Cooper pool table. Thank yo for clarifying that recovering felt will not pose a problem. 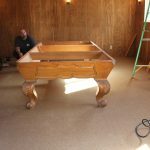 My next question is if it is very costly to put a finishing bottom wood trim that hides the felt on a pool table top, since the finished bottom trim was only put on the billiard top. Thank you for your patience with me concerning this table with two tops:billiard and additional pool table top. Hi Sherry, could you be more clear about your question regarding installing a “finishing bottom wood trim that hides the felt”? Do you mean a dining top conversion? 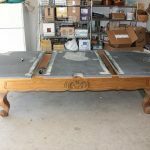 I have a Delmo regulation pool table with additional billiard top that was my husband’s. He enjoyed playing for many years. Legs are carved as is the body. I am in Northern California and wish to sell it since I do not play. Any suggestions where to sell? The felt may need to be replaced as I was told once a table is moved, it is best to redo the felt. Selling to a private party is usually your best bet. Unfortunately Delmo pockets are expensive to refurbish and a standard set of #6 irons will not fit. 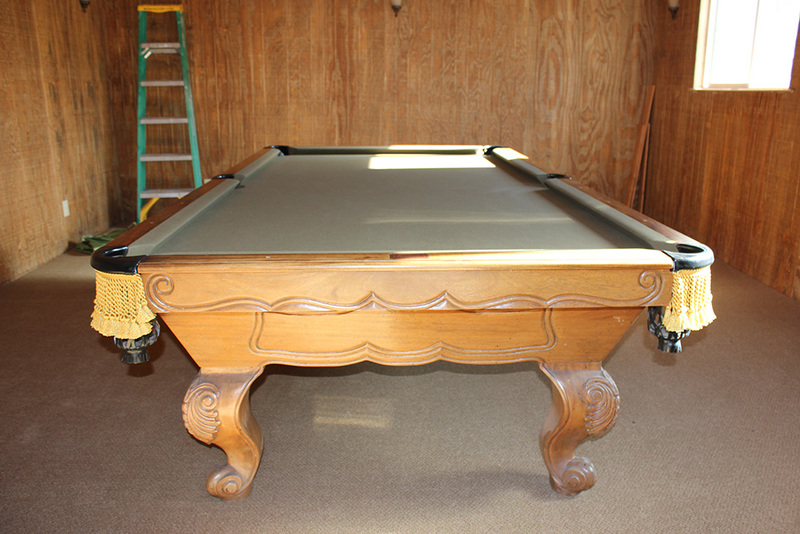 Contact your local billiard mechanic for more information regarding this pool table. I have exactly the same table as you are showing here. 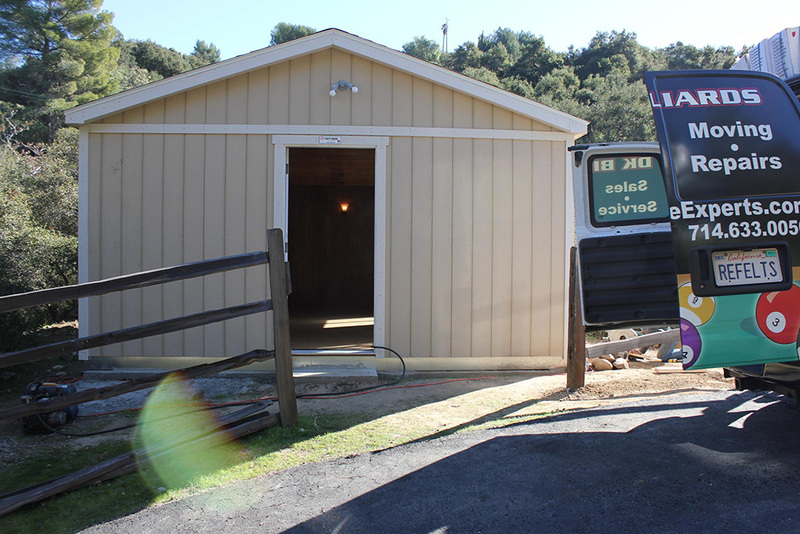 It has been refinished and is beautiful. I’ve had it for about 10 years and unfortunately it’s time to sell it as I need the room. What do you think this table is worth? Thanks! George. Hello George, sorry to hear about your having to part with such a well built pool table. Have you considered hiring someone to disassemble it for you? Unfortunately, if you were to sell it in the current used pool table market you’d only be able to get less than half of the table’s true value. Here in Southern California I probably ask $2500 and would include everything with the table including delivery and installation. Best wishes, David. Thanks, David! I appreciate the quick reply and I think we’re on the same page on the value. I live outside of Austin, TX, otherwise I’d be giving you a call. It is a wonderful table and it’s going to be hard to part with. Thank you! I have a Delmo Pool Table that I inherited from my Dad who past. It was a big part of my childhood and very special to him. Well, before I got it my mom had it and used it for everything but to play on it! It’s still in good condition for being 35+ years but has lost some luster…. Here is my question …. I wanted to sand it down and re-stain it, re-upholster it etc. But since it’s older and the thing to do to old memorabilia is usually to just leave it as is. Would I be devaluing the table if I do try to restore it??? Great story,thanks for sharing. No I I don’t think that you would devalue it, assuming you did a decent job restoring it. Good luck, Dave. Just got my Delmo installed today , Rebco did a amazing job.. this table will never leave my home ..
There’s just a few things I know about Delta. My 2 partners, Alfio and Zvanimir started with an guy who had a lot of starting capital. This is before Delmo was started. The storygoes that theire was a conflict between the 2 bothers and theis invester after the business was running. They severed that relationship and then Delmo Billiards was started. When and were do these reunions happen? Sounds like fun! Well I guess they can happen just about anywhere. 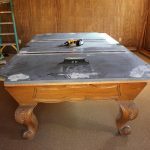 I’ve worked on so many Delmo tables, from luxurious million dollar beach homes to dirty Long Beach garages. From one piece slates to three piece slates, they’re all over the place! History of Delmo Billiards:Torben Gramstrup use to be the foreman of Acme Recreational products,Los Angeles.My husband Odd use to work under him. they both decided to start their own businesses.Torben strted Scandia with his brother-in-law Kjell. That business did not make it. According to the grapvine,someone invested money so he could start Global billiard Mfg., which he made a success out of. In the meantime, my husband &2 brothers from Yugoslavia started Delmo in my husband’s father-in-law’s garage&later moved to Pico Blvd. 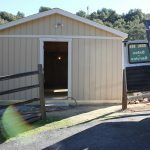 Ater 6-8 mo., the businessgrew so fast, they had to move into a bigger place in Carson city, Cali., My husband decided to leave the business for a better environment for his children. We lived in Nevade for 2yrs. Then we decided to move to Alaska for a total change of scenery. 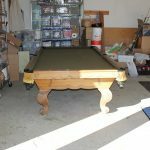 My husband than started a business, Norskman Billiards, selling and repairing pool tables plus holding down a full time job. Now we are retired&look back positively to past life experiences which includes Billiard enterprices. Thanks again. I appreciate the brief history. Can you tell me about your rival competitor Delta Billiard Mfg.? Who were they? Why were their pool tables so similar to Delmo’s. Carson City, Cali. I’m glad you’re enjoying the pool table! Thank you Virginia for that little bit of history. 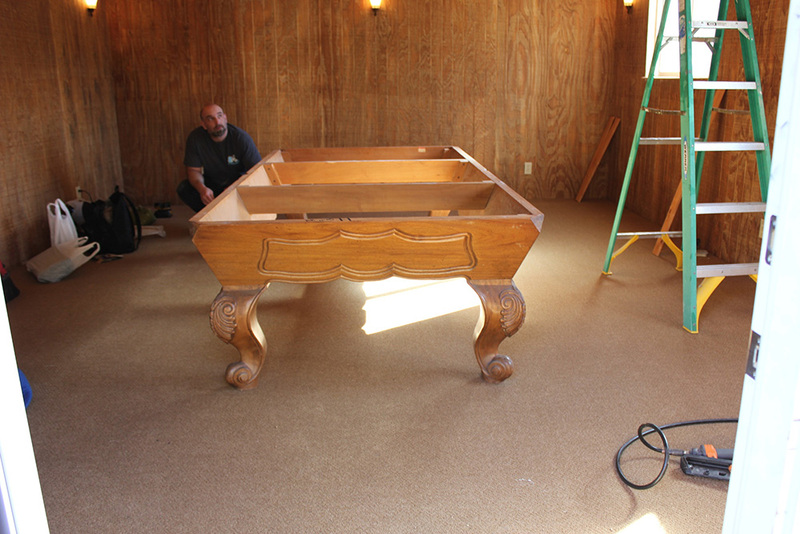 I’m actually the guy who restored the Delmo pool table for my client John Guillermin. John still remembers buying this pool table from your Husband. Although he thought he was a Dane. Thanks for sharing. Dave. Good morning Joshua. The Delmo pool table company is not in business anymore. They are very well made pool tables. It would be great to hang on to, if you’re into billiards. As fa as selling it, well that depends on the condition of felt and cushion rubber and the leather pockets. If you don’t have a space for it now, I’d consider just having it disassembled so that you can store it until you’re ready to play on it. Best wishes, Dave.